You are here: Home » Can You Come Up With A Title? Can You Come Up With A Title? I’ve sat here trying to come up with some clever, witty title for at least 10 min. Seeing as this girl needs to get to bed, I’m just gonna run down dinner. Mom cooked up some local side-striped shrimp tonight, in some garlic, lemon juice, olive oil, white wine, and parsley. I love me some seafood. 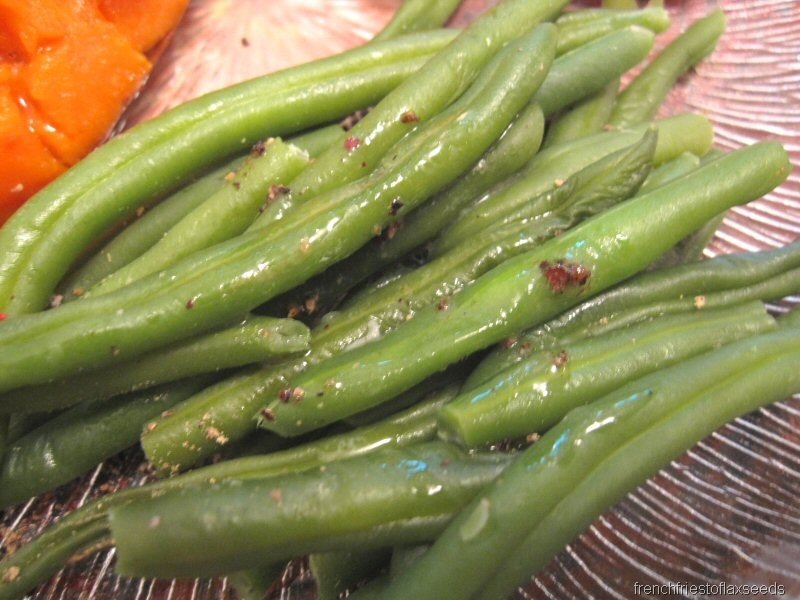 There were also steamed green beans. 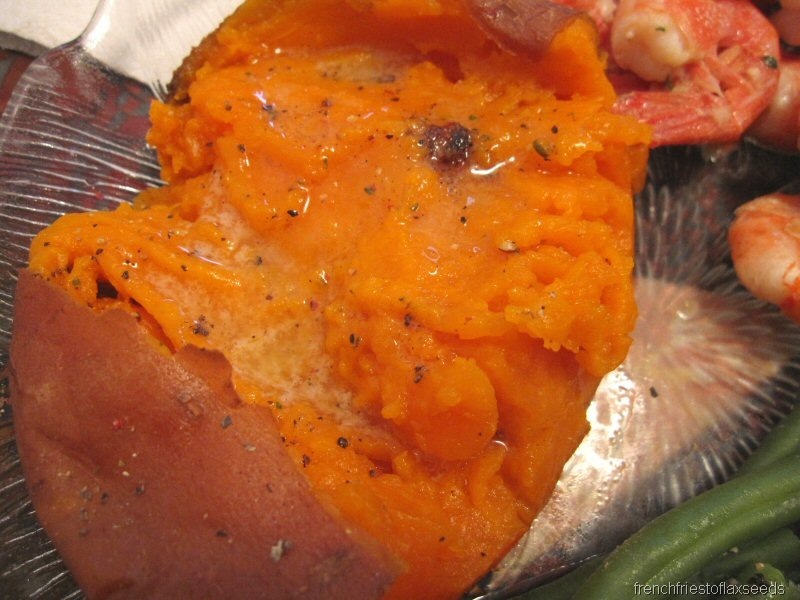 And I had half a baked sweet potato with butter. It got a little over cooked though, so it was almost a bit watery. Doh! Oh, the shrimp were delicious. They were so sweet and cooked to perfection. I think mom is on a mission to get some more of these local guys. So good! 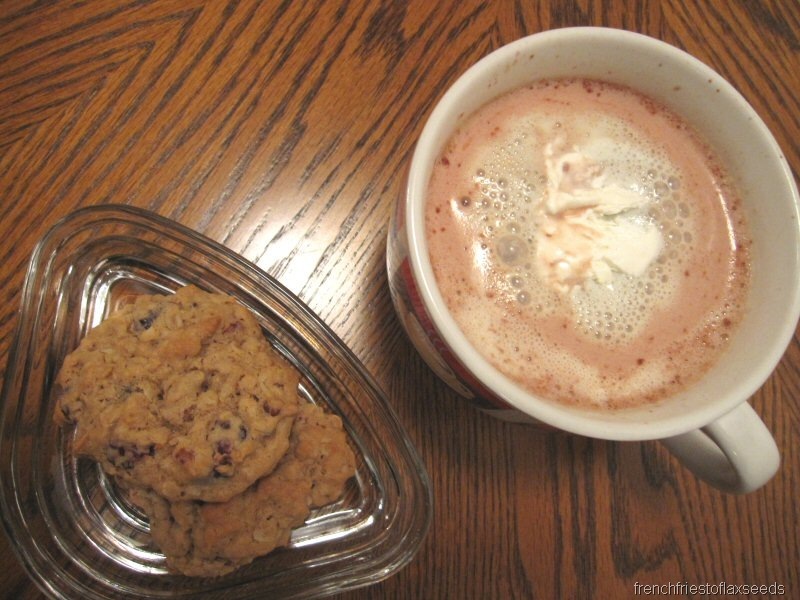 We had some fresh baked cookies (courtesy of mom) to dip in the frothy chocolately goodness. 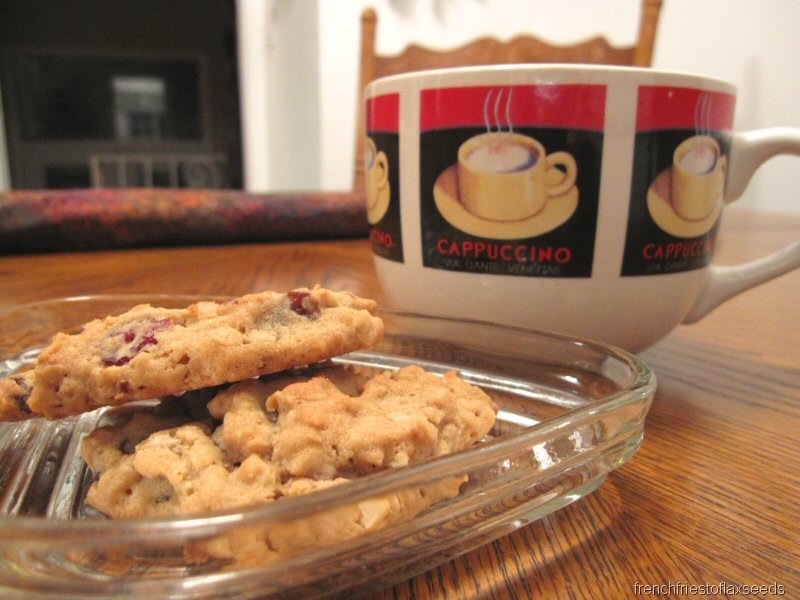 These cookies had raisins, oats, coconut, craisins, and pecans in them. Yum! Wednesday = done! Now I sleep. Night! Those cookies sound awesome! I love that your mom bakes – mine doesn’t at all so it’s up to me! What a colorful dinner! I love seafood. I grew up on Cape Cod, where it’s hard not to like seafood. Shrimp is a favorite of mine. I love the creativity with the cool whip! Great looking dinner! Even BETTER looking and sounding cookies 🙂 And hot cocoa?? Yeah! Another great reason to love fall and winter. 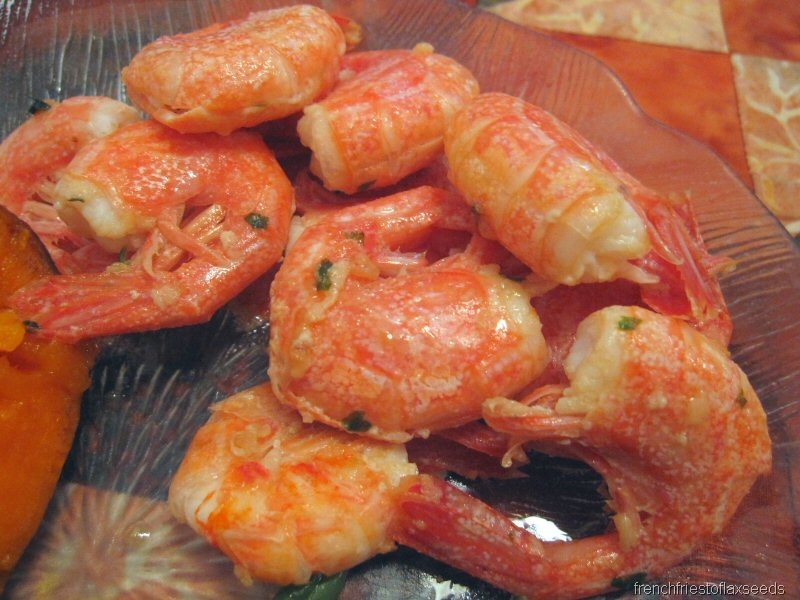 The shrimp looks delicious too – does your mom cook it in the shell? That dessert was the perfect ending to your night as far as i’m concerned!!! 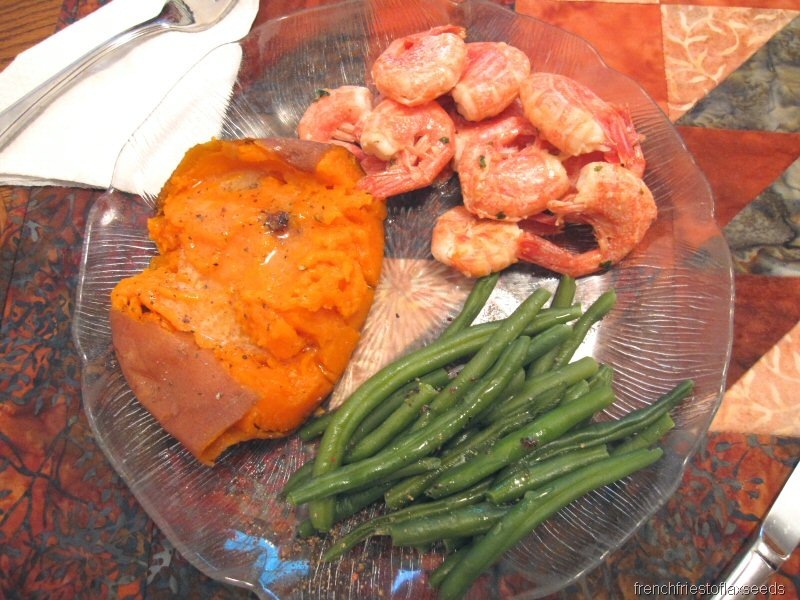 Mmm what a delicious meal…sweet potatoes always hit the spot! Mmmm, my weakness is freshly baked cookies.